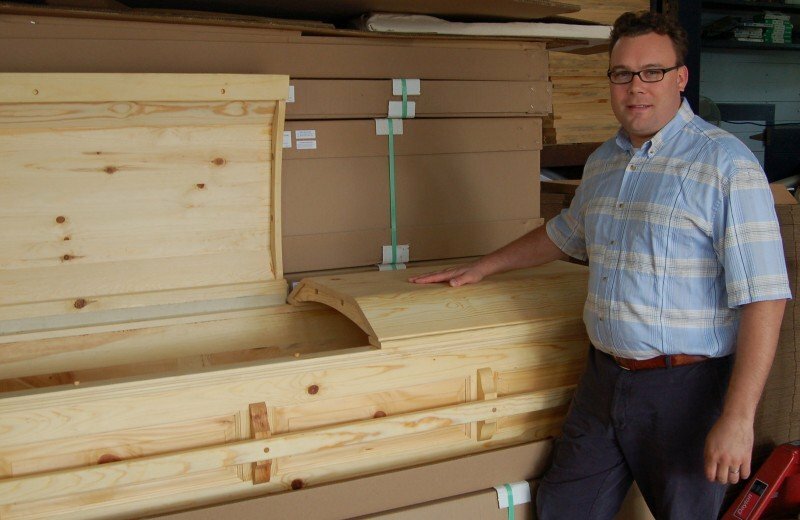 Jonas Zahn started Northwoods Casket Co. in Beaver Dam after designing and building a casket for his grandfather. The business focuses on environmental sustainability along with a desire to offer a simple casket alternative. The company has a commitment to plant 100 trees for every casket it produces. Partnering with Wisconsin’s forestry program, Zahn’s company has already planted 25,000 trees throughout the state. 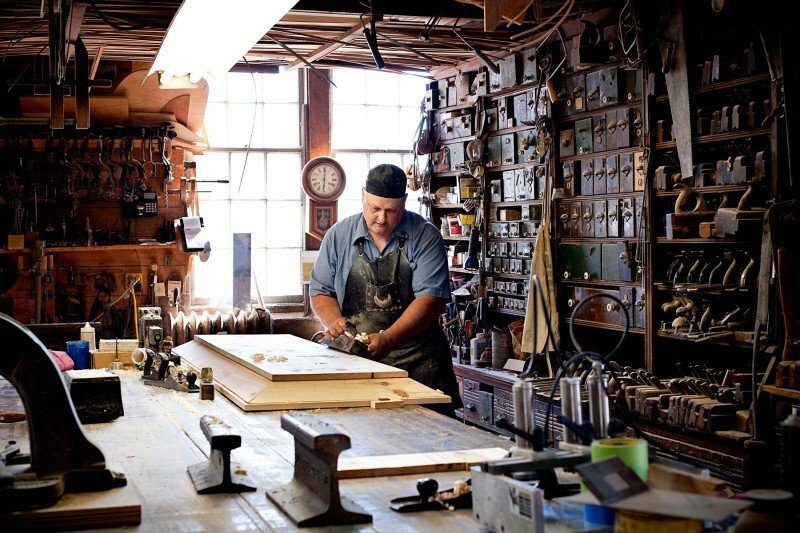 Carpenter Jack Rhodes works an antique hand plane over a casket lid. All caskets from Northwoods Casket Co. in Beaver Dam are hand-crafted. Made from sustainable Wisconsin pine, this panel casket contains no metal and is finished with natural oils. One hundred trees are planted for every casket the company makes. BEAVER DAM — Jonas Zahn’s grandfather died during the winter of 2004, just before the holidays. So on a cold December day, aunts, uncles, cousins and siblings all convened in his grandparents’ farmhouse near Mayville to discuss how to proceed. The exchange between family members was difficult. But Zahn had an idea after family members couldn’t agree between a burial or cremation, something his grandfather viewed as the only alternative to a large, expensive funeral. Zahn’s grandmother insisted his idea was what her husband would have wanted. The family agreed. And while Zahn didn’t realize it at the time, a business was born. In 2010, Northwoods Casket Co.’s first year, Zahn’s company sold 30 environmentally friendly caskets that contain no metal, are made with all natural materials and have minimal environmental impact. In 2011, sales doubled to 60. With more than 130 funeral homes in 10 states selling his caskets, Zahn expects strong sales to continue. The suggested retail price for a simple pine box is $999, while a three-panel box goes for $1,599. Zahn, a civil engineer for IBM, had no idea how to build a casket but after his grandfather died, began researching the process. That led Zahn to design his own casket. He brought the plans to John Leiting, a local Beaver Dam funeral home director, for approval. “I asked what the rules were for a casket,” Zahn said. He discovered there are no rules governing casket construction. Leiting, however, had one directive. Over the next week, Zahn, with help from his siblings and father, built his grandfather’s casket. The process was slow, multiple 10- to 12-hour days, but the opportunity to reflect on his grandfather while building his casket gave Zahn an emotional outlet for his grief. Zahn wanted others to have the opportunity he had to be involved in their loved one’s burial. Over the next five years, Zahn designed and built more than 20 casket prototypes. In the process, he found his evolving personal convictions regarding environmental sustainability fit naturally with his desire to build a simple casket alternative. In 2009, a good friend gave Zahn the nudge he needed to make the jump from prototypes to production. Within a year, Zahn, who continues to work for IBM, formed his company and began producing his first caskets. From the outset, Zahn chose a wholesale sales and marketing strategy in which funeral homes were the sole sales and distribution channel. This approach made business sense for Zahn, allowing him to focus primarily on casket design and production. In 2010, inside the expansive carriage house behind his historic four-square home in downtown Beaver Dam, Zahn built Northwoods Casket Co.’s first casket. From that first casket on, Zahn has made every attempt to minimize his company’s impact on the environment. All Northwoods caskets are built with discarded red pine slab wood, the unused parts of wood harvested from a log. Every part of the casket, from the natural cotton upholstery to the linseed oil finish coats, is composed entirely of natural materials. For Zahn, a green casket company was the only type of business he was interested in operating. The good news for Zahn is he’s not alone. Funeral directors across the country are reporting back to Zahn that eco-friendly products are precisely what many people are looking for. But Zahn’s interest in sustainability goes deeper than offering environmentally friendly casket options. From the beginning, Zahn made a commitment to plant 100 trees for every casket produced by the company. Partnering with Wisconsin’s forestry program, Zahn’s company has already planted 25,000 trees throughout the state. For Zahn, building sustainable caskets continues to be a rewarding experience in social entrepreneurship. And he enjoys the challenge of small business ownership. But Zahn’s true passion is tree planting. While more people are interested in an environmentally friendly burial, few businesses in Wisconsin specialize in crafting caskets with all natural materials.